After the digital release of their eponymous debut EP on the 18th of February, the indie-rock band Alice Roosevelt now wishes to offer you the opportunity to listen to their music on a vinyl format! Who are we ? Alice Roosevelt is an indie rock band based in Nyon (VD) . We formed in late 2014 around common influences. Bands such as Foals , The National, Local Natives and many others influenced this first EP. The band is formed by Patrick Dalzell (lead vocals), David Lamon (guitar), Cyril Pugin (guitar), Théo Deluz (drums) and Cyril Huguet (bass). We spent the majority of 2015 creating the songs that make up this first eponymous EP. The five songs have received a great welcome since the release, and we are fortunate to have the support of the national radio Couleur 3 which has playlisted the title «the clan Responded ». You can listen to this this song below. We hope that with your help we will get the funds needed to press our 5-track EP on vinyl . We are ourselves big fans of this unique listening format, we would be very happy to share our music with people who also have the same passion for playing records. Huge thanks to you guys for your precious help. Our first Alice Roosevelt vinyl EP sent with love directly to you. We send you a package with a lot of love, our first vinyl EP, an Alice Roosevelt tote bag, and a poster representing the covert art of the EP. We send you a package with a lot of love, our first vinyl EP, an Alice Roosevelt tote bag, and a poster representing the covert art of the EP. We also invite you to one of our future gig for free ! We come to your place, we give you our vinyl EP, and we play a 45min private concert (as long as the provided space allows us to play in live configuration) and also, we will continue the night with an awesome DJ-set. 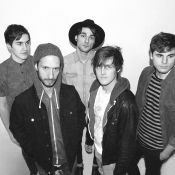 Formed late 2014 in the city of Nyon (VD), Alice Roosevelt is an indie-rock band influenced by such artists as Foals, The National, Local Natives, Caribou and many more. We just released the digital version of our first EP, and the song «the clan responded» just joined the Couleur 3 radio playlist. Come to one our show, and discover us live !